We've been asked for some flute trios, so here is one! Christmas may still be far away, but you know... it often takes some time to put a trio together. This little piece, whose German name “Die Schlittenfahrt” means “The Sleigh Ride”, is one of the most popular of Mozart's numerous orchestral dances. 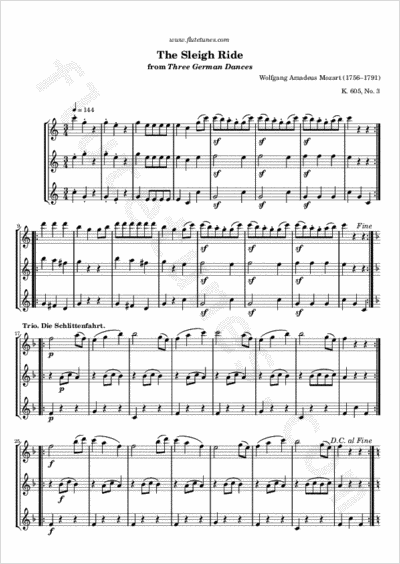 Written near the end of his life, it is, like many of the composer's other “German dances”, a Ländler, a simple dance in triple meter that was the predecessor to the waltz. Its most unusual feature, and the one that inspired its nickname, is its original scoring: in addition to a small orchestra of two violins, bass, two flutes, two oboes, two horns, and timpani, it calls for two posthorns and five sleighbells that bounce along on each beat.